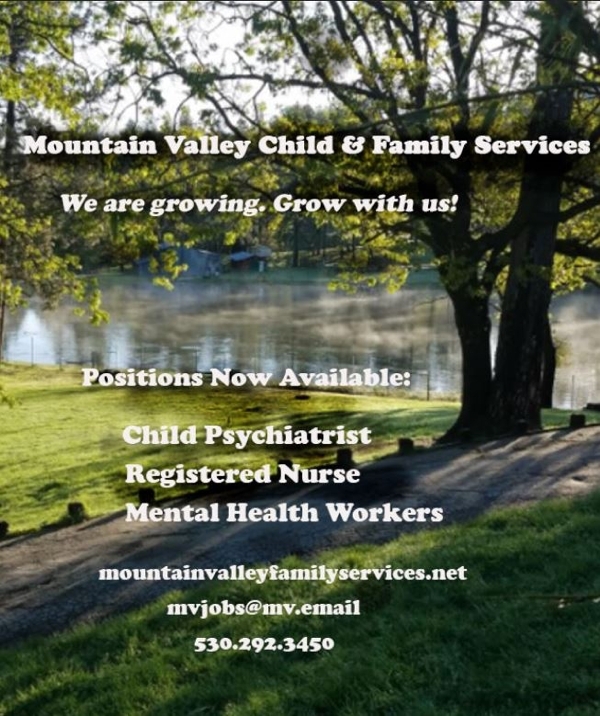 Thank you for your interest in employment opportunities at Mountain Valley Child and Family Services (MVCFS). Please find our current job openings listed below. For over 34 years MVCFS has helped more than 4,000 California children in our residential, therapeutic and educational programs for troubled youth. We provide individualized treatment for troubled youth and teens, ages 10-21. The MVCFS professional team is comprised of therapists, educators, and staff all committed to helping and supporting the needs of children with serious emotional disturbances, learning challenges, behavioral and mental health disorders. At MVCFS we work hard to create a strong and engaging work environment for our mental health and education professionals and look forward to speaking with you.